Providing youth the chance to learn skills and dedication. Even before the Lion's Den opened their doors manager Craig Salamone was recruiting kids for their Champions of Life amateur boxing program. "Give me your toughest of the tough," stated Salamone as he contacted the Youth Services Bureau. The Lion's Den wanted to ensure that people knew their new program was available to help all kids, but particularly those who might have been "given up on" over the years. 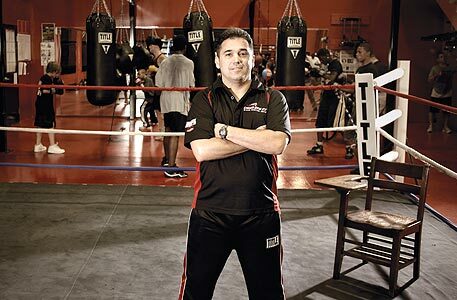 The catalyst for the program is Coach Johnny Callas (Charter Oak Boxing Academy), who shapes a program that aims to give young people (ages 8-18) the opportunity to learn skills and dedication while being part of a team. Coach Callas' experience goes well beyond the boxing ring as he has been a long-time MSW in the DCF system, currently serving as a youth advocate. His experience inside the ring is equally impressive as he is a former national collegiate champion and a fifteen year professional boxing referee. To start working with Middletown's youth, the Lion's Den received a small grant for scholarships through the city's Educational Incentives Challenge Grant program. Upon deeper investigation the gym found the grant alone couldn't support the amount of interested kids, so they decided to double the amount of scholarships (contributing half of them on their own dime). In addition, they offered to allow the YSB to work with the local schools and service providers to identify and select young people who would benefit from the opportunity. Over this time, and through the city's Education Incentives grant process, the program became more involved in the Developmental Assets initiative. Like many programs working with young people, the assets didn't create radical change on how they did things, but strengthened their approach to youth development. As Callas notes, "The 40 Assets have helped to validate the good things we are doing and helped us expand the way we nurture our kids into ‘champions of life". To deepen the program's exposure to Developmental Assets Callas organized a two-hour workshop with the YSB to give staff, students, and parents an opportunity to review the framework and select Asset priorities. For Callas, this was a chance to get the entire "team" behind the Developmental Assets and to celebrate the great things they were doing and make them even better. As a result everyone associated with the program walked away with a unified approach on what young people need and how they would work collectively to get them there. Shifting thinking to focus on engaging youth development. Collaborating with youth to discover the keys to success. Being welcoming builds confidence in the social skills of youth.